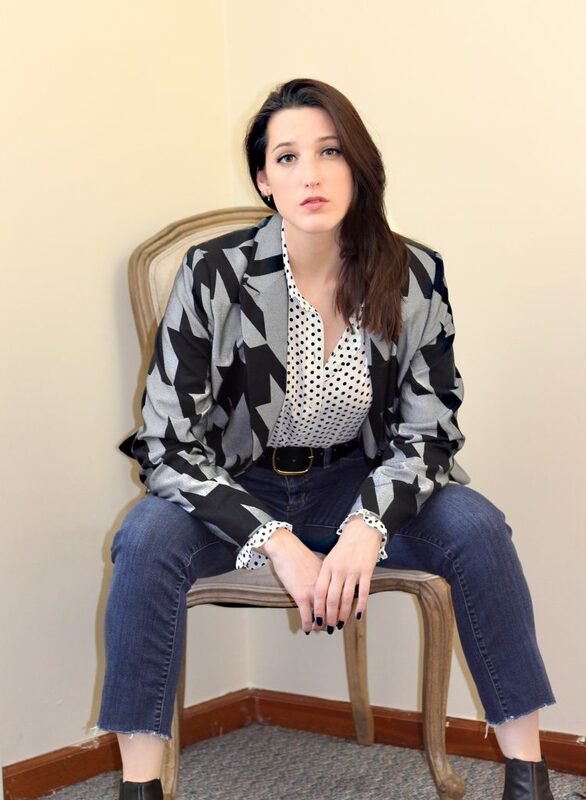 As you can probably tell from my outfit posts from the last few months, I love blazers. They are my go to when I don’t know what to wear—I love trying to pair them with different pieces and prints and colors. This look in particular is probably my favorite and easiest to recreate. The scale of the prints. 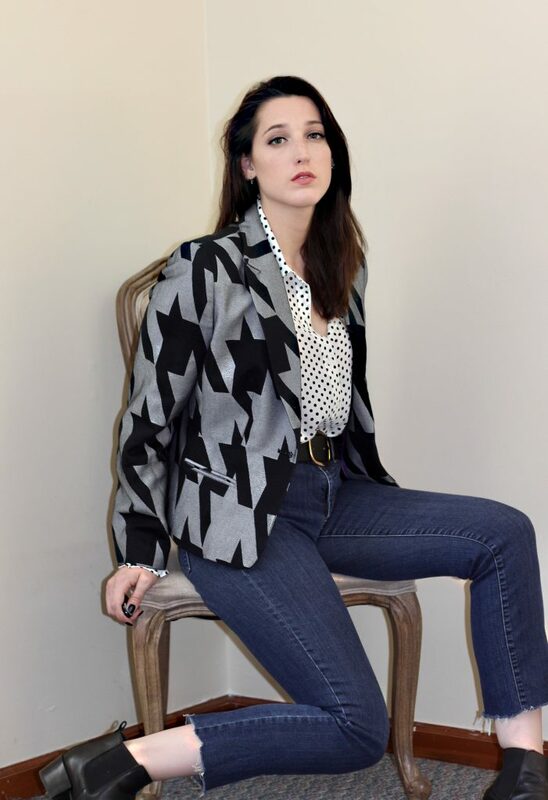 The scale of the dots is pretty small compared to the oversized houndstooth print on the blazer, and the contrasting scale really takes this look up a notch. 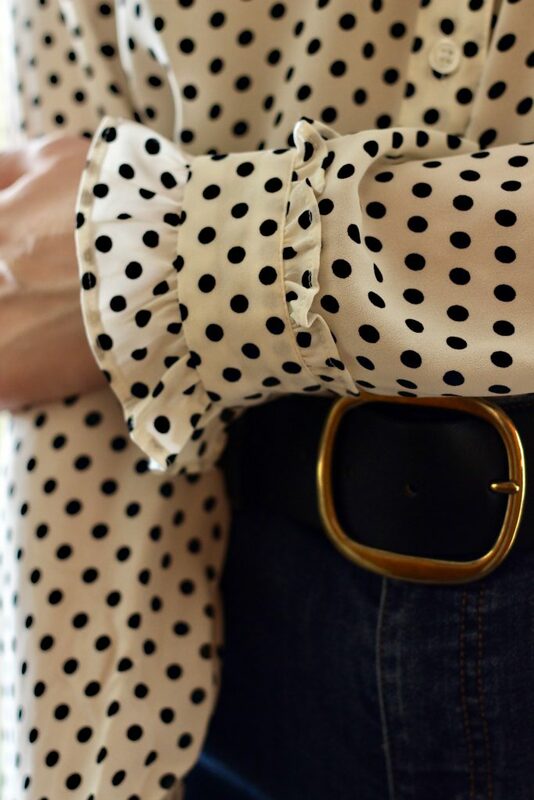 Also, if you’re not tired of me talking about this polka dot shirt from Target you’re in luck, because it’s still one of my favorite shirt styles of all time! I even bought it in another print! 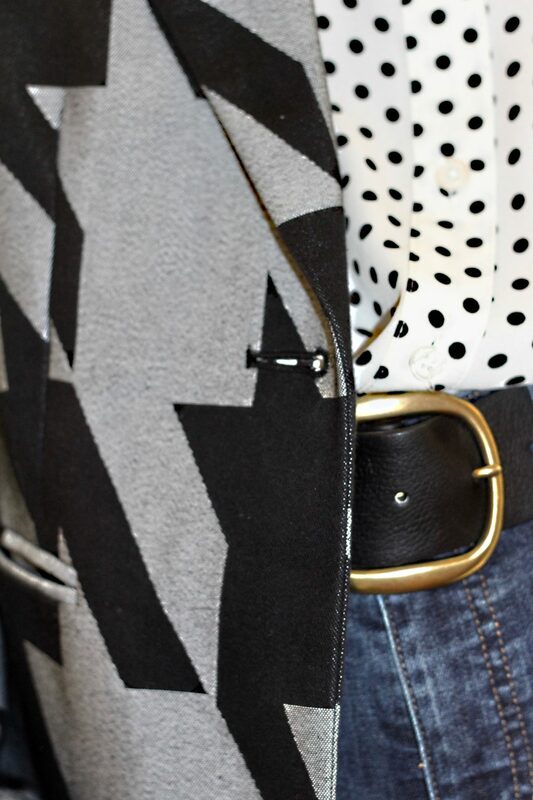 The dark wash jeans with only a raw hem keeps this look sleek while keeping you focused on the top. If jeans don’t work for your office, a soft pair of wide-leg pants will be an easy swap to keep this outfit looking polished while adding a new dimension with the play on proportions. I kept the accessories basic, tying back to the black in both prints on the top and the blazer. The boots skimmed the hem of my pants to leave only a sliver of ankle showing for a more casual look. If you chose the wide-leg pant instead of jeans for the office, a pair of mules would be the perfect compliment. Start with a blazer. 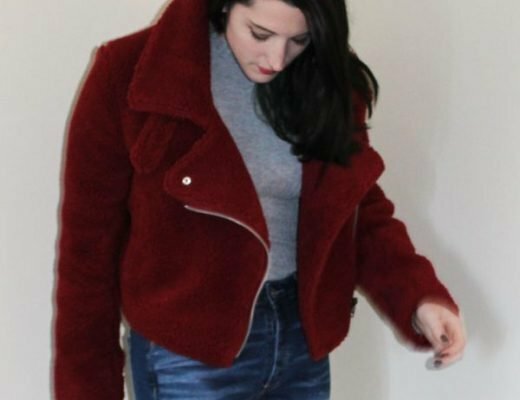 Blazers are all over the place right now so it will be easiest to find one that fits your style and figure out the rest of the outfit from there. On to the shirt. This is where you need to choose a print either scaled up or down based on style of blazer you got. Here is where you can add other details too, such as ruffles, ties, volume, etc. Bottoms next! This is where you either go up another level or just finish the print mixing. 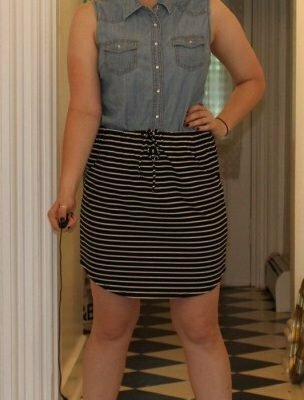 If I was going all out on this look, I might have added a mid-sized striped pant that also had black in it. 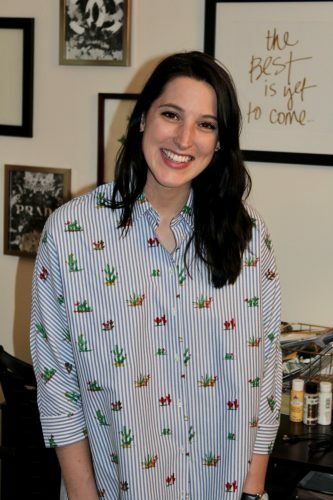 If you are happy with your level of print mixing, go with a solid color bottom that is either a neutral color or the base color of the print you were mixing. Finally, the shoes. I don’t usually print mix my whole outfit, so I would definitely stick with solid black shoes (or whatever base color you choose). Let me know if and how you print mix and what prints you are most excited to wear for fall in the comments! I wish I could pull off mixing prints. I just don’t think they look that great on me, like they do others [i.e. like you!]. Maybe I’ll have to give it another go. I’m not a big fan of polka dots though, so maybe stripes would be a better alternative for me! Yes! Anyone can mix prints 🙂 stripes are a great alternative because they come in so many different scales and colors. Yes! 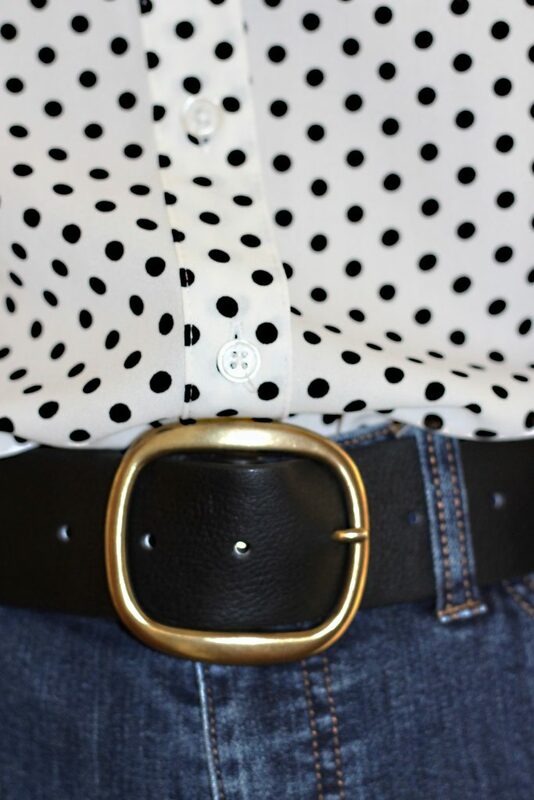 I totally agree that leopard is the perfect fall neutral! I recently bought three pieces of leopard print to sprinkle into my wardrobe. Wow you lol awesome, if only I could pull this kind of outfit I will. You great and that dotted top looks beautiful on you . Great pick of outfit . Thank you! I think you could definitely try something similar 🙂 Maybe with different prints like a small stripe mixed with a medium scale floral. What a cute look! I’ve only recently started to experiment with print mixing.